What is Clay? What is it Made of and Used For? Find out about clay. What is clay made of? What is it used for? Is it soil? Learn what a clay body is, what clay slip is, how clay is colored, and how to find clay supply. What is Clay? - Clay is a form of soil made up of very small particles of aluminum silicate created by the chemical weathering of rock. Clay is not very good for growing plants, but it is the key ingredient to making pottery. Because of the way that clay particles are shaped, clay can take on varying degrees of "plasticity". Plasticity - is the ability of clay to be bent or stretched. The more plastic a clay body the more workable the clay and the easier it is to shape into pots. What is a Clay Body? - is the specific recipe used to make the clay. It may have just one type of clay or it may be a combination of ten different types of clay. Non-clay materials can be added as well to create different properties in the clay. For example, grog is a coarse sand-like material that adds strength and reduces shrinking during firing. Adding frit to a clay body causes the clay to begin melting and fuse at a lower temperature. 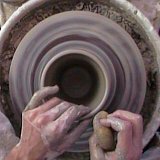 Coloring Clay - The color of clay is naturally varied, ranging from rich terracotta reds to buff, brown, and white. Other ingredients are often added to change the color of the clay. Iron can be added to create more red in a clay. Stains and other minerals can be added for more dynamic colors like blues and greens. Clay Slip - is a liquid version of clay. It has many uses. It can be poured into plaster molds to form "slip cast" ceramics. It can be colored and thrown pots can be dipped in it to change the surface color and texture of the pot. It can also be used as a glue to attach pottery pieces together, or even drizzled over the surface of a pot to create designs. Where Can I Get Clay? - Clay can be found in the ground and processed for making pottery. 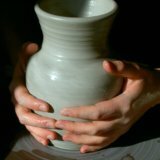 See how to make homemade clay to learn how to dig and process your own clay. Fortunately, if you want to save the time and effort of digging it yourself, it can also be purchase from a clay manufacturer. They do all the digging, processing and formulating for you. 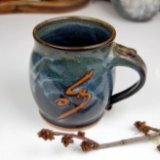 See the Pottery Supply Store for some great clay bodies to get you started. 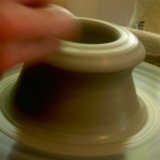 Go back to Pottery Clay from What is Clay?